The October 2016 issue of Tabletalk will look at the sixteenth century. In particular, the goal of this issue is to introduce readers to the key events, people, publications, and ideas that shaped the Protestant Reformation. 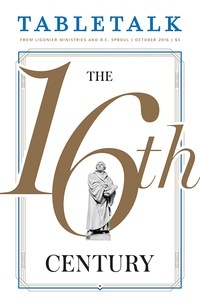 After explaining the necessity of the Reformation and the history of the sixteenth century, it will consider how the Reformation addressed a variety of topics such as theology (Scripture and justification), the church (worship and sacraments), the home (family and piety), and society (vocation and education). The issue will consider the vast scope of the Reformation in order to give a greater appreciation not only of its history but also of the need to continue the work of the Reformation today. Contributors include R.C. Sproul along with W. Robert Godfrey, Nick Needham, Stephen J. Nichols, R.C. Sproul Jr., Jeffrey K. Jue, R. Scott Clark, Michael A.G. Haykin, Joel R. Beeke, Gene Edward Veith, and Peter A. Lillback.